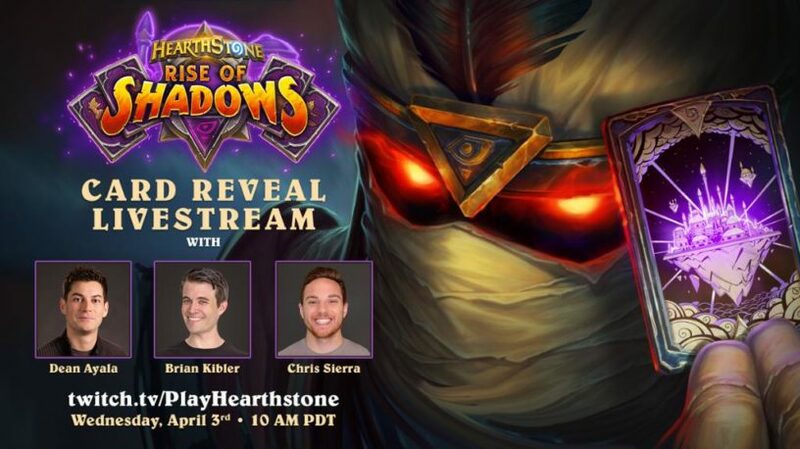 Home » News » Final Card Reveal Livestream for Rise of Shadows: Times, Date, How-to Watch! The final card reveal livestream for Hearthstone's new expansion Rise of Shadows has been announced, and we've got information on the times, date, and how-to watch it! While last time was a bit shaky, we've got a mostly new batch of hosts this time around with Dean Ayala (Game Designer), Brian Kibler (Streamer), and Chris Sierra (Community Manager) taking us through the cards! How these final card reveals work is that they will be showing off at least 20 or so cards and playing a bunch of decks that will feature these cards in action. We usually don't get a full reveal from the stream, but not too long afterwards the rest of the cards are dumped and we will finally get a full idea on how the set will look. We of course will be featuring all the cards on our post here! We'll be posting all of the cards from the stream in this post. You can find the stream on Blizzard's official Twitch Channel! If you are more of a YouTube fan, they typically have a stream going on there as well, which you can find right here. The final Rise of Shadows livestream will be on April 3rd, 2019 at 10am PDT. I've added a couple more time zones below! I said they’ll show “20 or so” ON STREAM, and then they’ll dump the rest on Facebook and their website like they’ve done in just about EVERY EXPANSION. In the last expansion, they revealed 18 cards in the final reveal stream. Learn how to make a point without an insult, especially when you are completely wrong. They also aren’t going to be revealing 20 cards prior to the stream.